To Dog With Love: 75 - 8 - 3 Blastoff to BarkWorld Expo! 75 - 8 - 3 Blastoff to BarkWorld Expo! What, might you ask, does 75-8-3 Blastoff have anything to do with BarkWorld Expo, the national pet social media conference in Atlanta, October 25 - 27, 2012? There's only 8 days left to SAVE and register early before prices go up! 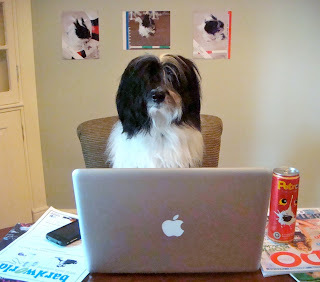 And, there's still 3 days left to WIN by entering the Iams Home 4 the Holidays How Can I Help Pet Adoption contest for a chance to win an all expense paid trip to BarkWorld Expo! Scavenger hunt for prizes like an Apple iPad, Petco gift cards and more! Hope you'll join us at BarkWorld, everyone will be there! 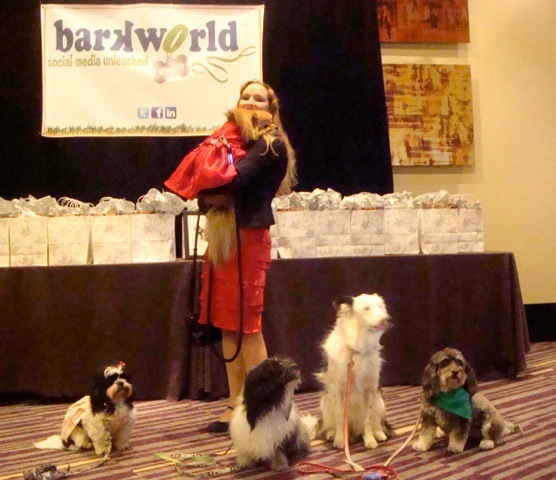 Kona, Pepper (and PepperPomMom), Cosmo, Paige and Jasmine at last year's BarkWorld Expo. *sigh* and HOW many kittehs go...? Maybe we canz get our mommy to represent us there...! There were kittehs there last year! You should come!!!!! Oh pooh! Hate when that happens! WOOF! I want to winz that all expense paid trips! Mommy usually leaves me at dah kennel when she goes far far away!! Would love to meet you here pal! Mom's looking forward to BarkWorld again! She can't wait to see you there Cosmo buddy! Can't wait to see your mom too! We'll have so much fun!